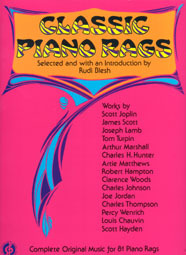 This book contains Sheet Music reprints of first or early editions of 81 piano rags from 1897 to 1922. Included are works written by ragtime greats such as Scott Joplin, James Scott, and Joseph Lamb. All 81 selections are piano rags and therefore have no lyrics. The publisher thanks Mr. Trebor Jay Tichenor and Mr. William Lloyd Keepers for the generous loan of sheet music to make these reprints possible.